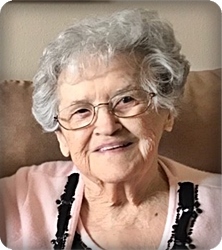 Marcella Martinez, age 90, of Wyoming, went to be with her Lord on Friday, April 5, 2019. A loving wife, mother and grandmother, Marcella will be deeply missed by her children, Antonio (Jane) Martinez, Timothy (Susan) Martinez; seven grandchildren; 11 great grandchildren; and her sister, Virginia Rayner. She was preceded in death by her husband, Antonio; son, Terry Martinez; grandson, Antonio Ira Martinez; great grandson, Tyler Smolka; great granddaughter, Victoria Smolka; brothers, Lavern, Claire, Keith, Gerald, Roger Erb; sisters, Marjorie Erb, Vada Fosburg, and Joan Lockwood. The funeral service will be held at 11 am Friday, April 12, at Stroo Funeral Home. Interment will be in Clarksville Cemetery. Visitation will be held on Thursday, April 11, from 5 - 8 pm and Friday from 10 - 11 am at the funeral home. Memorial contributions may be made to a charity of your choice. She’s going to be missed so much. She truly was beautiful inside and out. Thinking of her family at this time and wanting them to remember that we’re all here for you. We send our condolences & our loving comfort to your family.